As in years past, we have assembled a fantastic series of GiftGuides full of interesting ideas for our RainyDayMagazine readers. Our Guides includes items we have reviewed during the year, new ones we haven’t yet posted, and some from years past. The one thing that stays the same year after year is the selection criteria: all of our recommendations are things we have actually touched and things we would actually want. Cars are getting smarter and smarter. Sooner or later—given enough sensors—some will no longer need a human to tell them what to do. When that day arrives, personal transportation will have taken a giant step forward, in both convenience and safety. Even today we can enjoy some of the “it will soon be here” benefits of automotive smarty-pants-iness. All the items in this Guide can be installed by anybody who can operate a screw driver. 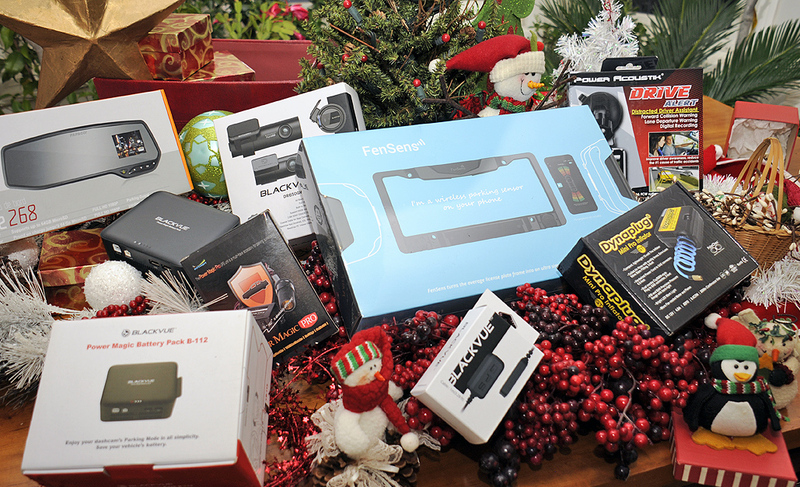 We have looked at a lot of dashcams over the years. Many of their improvements included sensors, image/video resolution, and low-light capabilities, but in the end, they were just video recorders. However, a new crop of devices are appearing with “intelligent” features that actually make driving safer. Statistics show that up to 90% of all traffic accidents are caused by distracted driving, NOT speeding or driving under the influence. Momentary inattention can cause the car to drift into another lane or get too close to the car in front of it. Devices which constantly monitor the car’s surroundings can help without being intrusive. 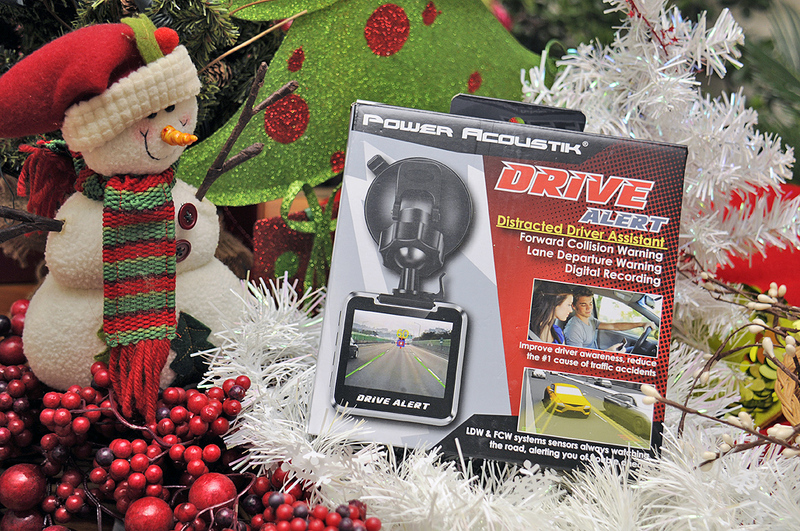 PowerAcoustik Drive Alert – Driver-assistance System with Forward Collision Warning, Lane Departure Warning, digital Video/Audio recorder (140º HD wide-angle recording), and an integrated 2″ TFT screen. A great “backup” for every driver. Want a dashcam, but don’t want something on the windshield or the dash? How about attaching one to the rear-view mirror? The Papago! GoSafe is more than just a rear-view mirror with a built-in camera; it has features designed to promote safer driving habits. 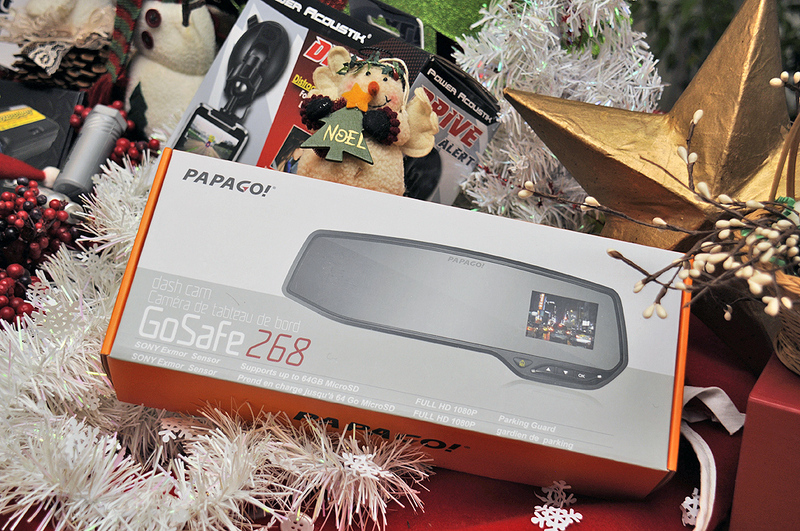 GoSafe 268 – Records full HD 1080P video with 135 Degree angle. Integrated 2″ LCD Display. Auto turn on. Loop recording. 4 Recording Modes: Automatic Recording, Monitor Mode, Motion Detection, Parking Guard. It also comes with Driver-assist features such as: Stop Sign Recognition, Driver Fatigue Alarm, Light Reminder. One dash cam may be useful, but having two is definitely better! The second camera can be pointed out the back window or into the cabin (almost a necessity for Uber/Lyft drivers). However, running two cameras is a pain if you have to operate them individually. 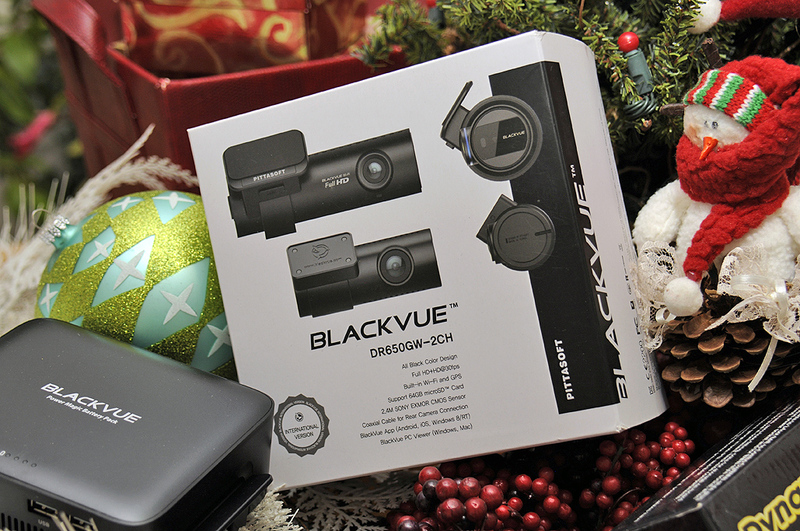 BlackVue recognized this early on and have been steadily improving their duo-dashcam offerings. Their new ones have higher quality video, and some even have IR-capabilities. BlackVue Duo Dashcams – Dual channel cameras with full HD 1080p (front) and HD 720p (rear) @30fps at a 129° angle of view, impact/motion detection, GPS, cloud accessible for live-view anywhere/anytime, and even push-notification. Having a dashcam running when the car is parked can provide some level of protection. However, it can also be a drain on the car’s battery. There are two solutions to this: a sensor to shut off the camera if it detects the car’s battery is approaching a level which may not start the car; and a backup battery that powers the dashcam and automatically recharges whenever the car is running. Neither solution will leave you stranded with a dead car battery. PowerMagic Battery – No hardwiring required and will automatically recharge when the car is running. Plugs into the car’s accessory (cigar lighter) power socket. Has extra USB ports to charge up phones and other electronic devices. Some people use the “braille” method of parking. For those looking for a less touchy-feely approach, FenSens offers an alternative. Their solution is a license-plate-based smart wireless parking sensor on your smartphone. It’s an affordable wireless upgrade for ANY car and can be installed in a few minutes. The hands-free app (Android/iOS) provides audio, visual, and vibration alerts. 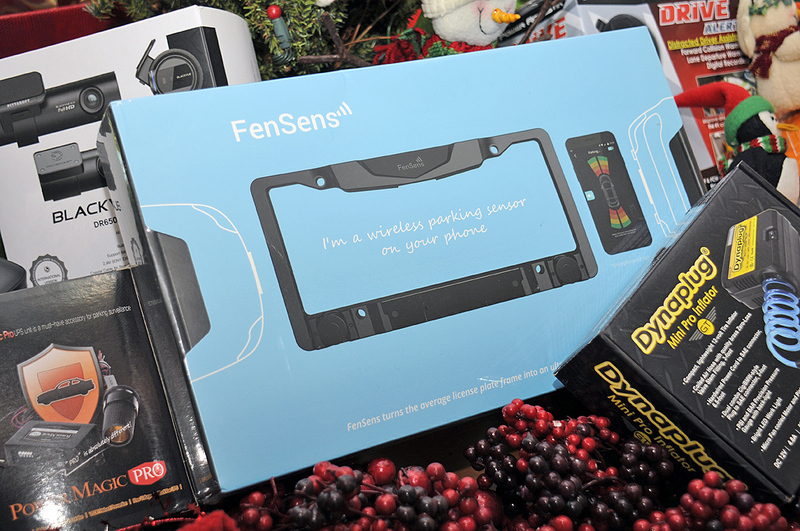 FenSens Parking Sensor – Ultrasonic weather-proof parking sensors provide audio, visual, and vibration alerts on your app. Wireless, AA-battery operated, and works for all consumer and commercial fleet vehicles not exceeding 30 feet in length. Getting a nail in one of your tires is annoying, but that annoyance can turn into a major hassle if it happens somewhere remote. Being able to fix the problem can mean the difference getting home or being stranded. We added the Dynaplug in our car’s “road emergency” kit a few years ago. While we have not needed to use it on our own vehicles, we have used it to get other people out of a “there’s the nail!” situation. Amazingly easy to use!!! Dynaplug Pro – Engineered for repairing punctures in tubeless tires for cars, trucks, motorcycles, ATVs, scooters, campers, motor homes, RVs and garden tractors. 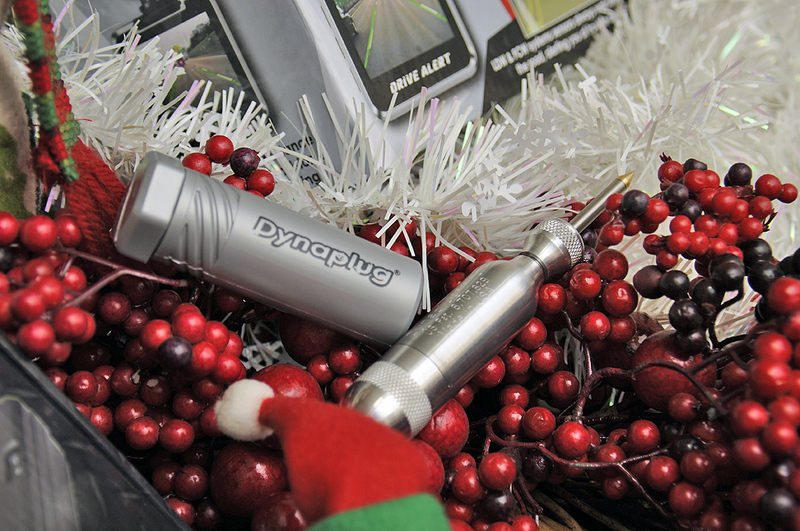 Five machined compartments that store extra insertion tubes, air stopper and clearing tool. Under-inflated tires waste gas, wear out faster, and can become a safety hazard (overheating, tread-separation, etc). It can affect steering and become an issue when braking on wet surfaces. Mini Pro Tire Inflator – This compact system has dependable components: zero-loss valve-stem fitting, dual fit plug for standard automotive power socket and BMW-Style socket (when red bayonet locking adapter is removed), back-lit pressure gauge with PSI/BAR readout and a bright LED work light.